This work of art was made by Banksy but we don’t know where and when. The title is Stop Wars. This is a painting. Maybe he used stencil to make the stormtrooper. And to write the word « STAR WARS ». In his hand he has a brush and paint pot, in which there is red paint. 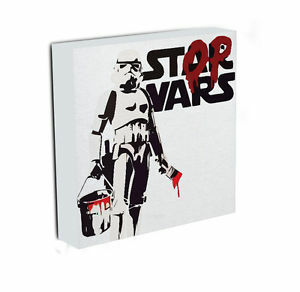 On the letters « AR » of the word « STAR » he writes the letters « OP » to create the sentences « STOP WARS ». Maybe the red paint represents the blood of the wars. His message is clearly to tell people to stop the wars. He decides to represent a stormtrooper writing because they are soldiers. The main colors of the paint are black and white and yet that we see the most is the red. It’s a great message to all people and it’s a good ideas to represent this.